Yesterday I shared with you the photos of my recently completed (as in 20 minutes previously) leaf project. I took actual leaves I had collected from the ground, dried and pressed and created what I call a removable "cuff" for glass cylinders. 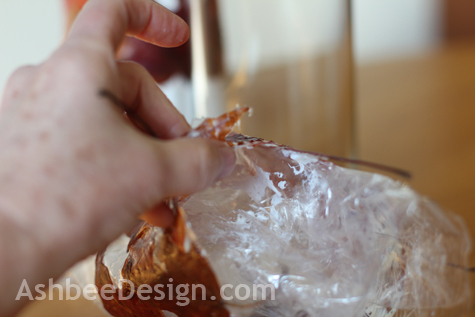 I created them to easily slide off because I have only the one set of glass cylinders and I use them in many different tablescapes. 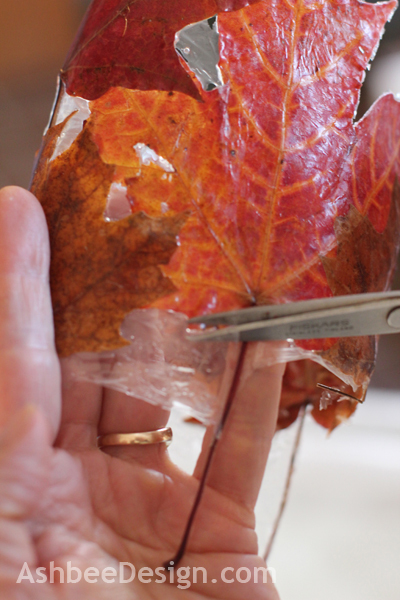 I had preserved leaves using the glycerine method and by pressing them under heavy books for two weeks. The leaves pressed in the books retained more of their color, especially the red ones. 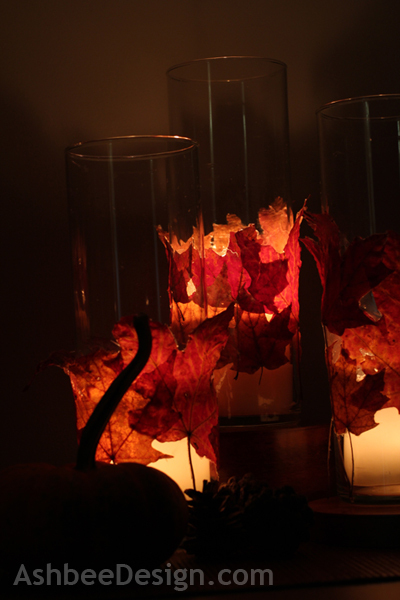 I wanted more color with these because of the effect created when the candle light shines through. 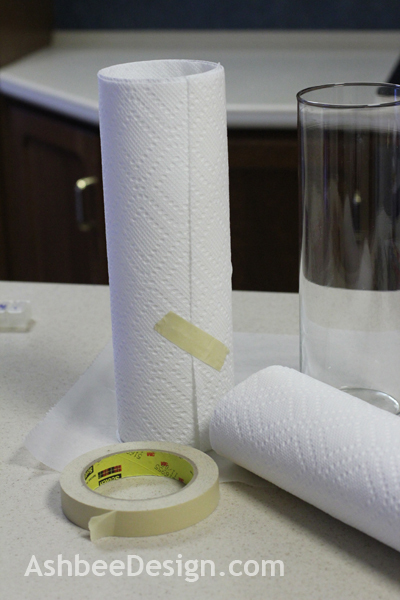 Wrap your glass cylinder in two layers of paper towel. This is to make the cuff a little larger for easy removal. Tape it in place but do NOT tape it to the glass. Next wrap a layer of Saran Wrap. 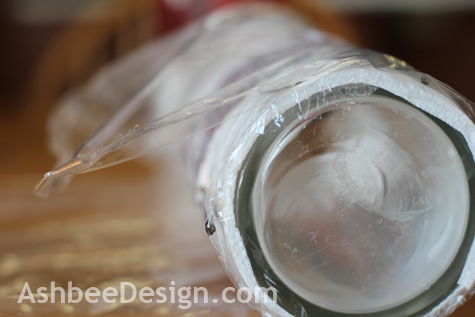 Do not apply tape but rely on the natural cling of Saran Wrap to hold it in place. 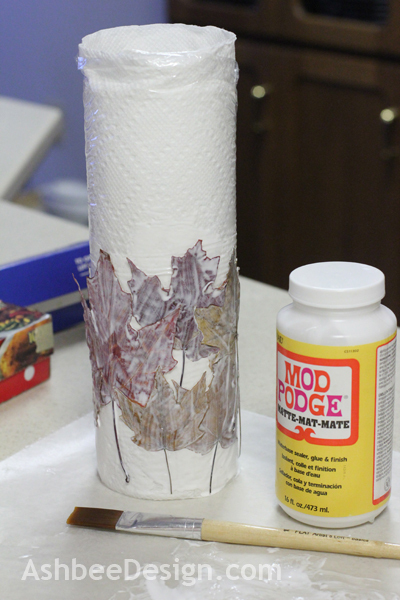 Brush a layer of Mod Podge onto the Saran Wrap covered cylinder in the area that will be covered by leaves. 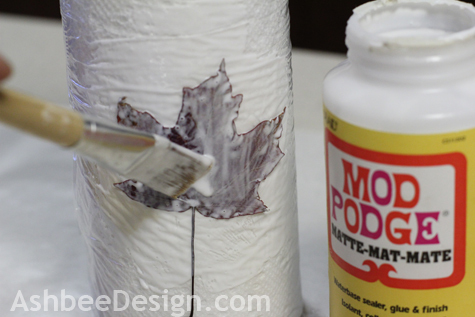 Brush more Mod Podge onto the back of the leaf. 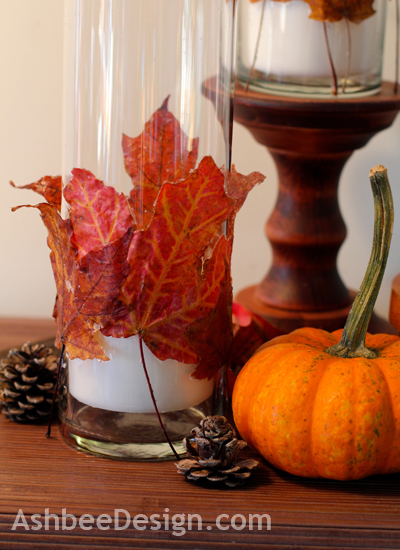 Place the leaf and cover it with Mod Podge. 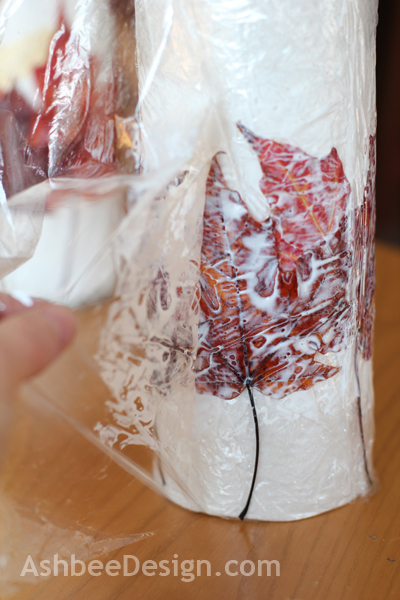 Continue placing leaves, each with Mod Podge on the Saran Wrap, on the back of the leaf and on the outside of the leaf. 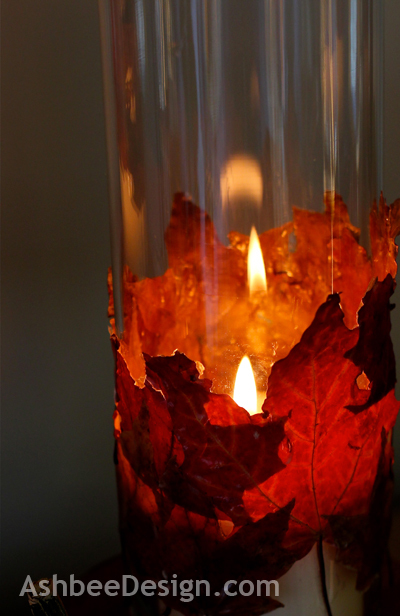 Place the leaves so they overlap each other creating a complete circle all the way around the cylinder. Try to brush out air pockets. I chose to do just one complete row with a few doubles but more could be added. I left peek-a-boo holes for the candle light to flicker in. 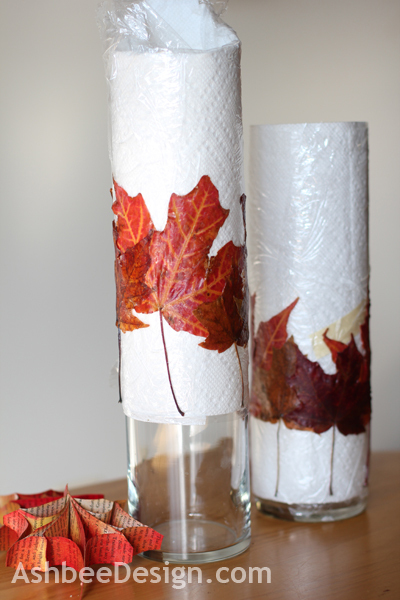 After you have completely covered all the leaves with Mod Podge add another layer of Saran Wrap to tightly hold the leaves in place. 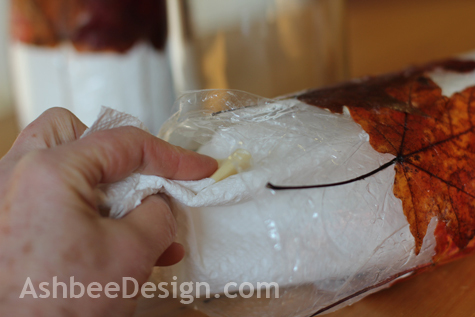 Wait over night and remove the outer layer of Saran Wrap. This helped tuck in the edges. 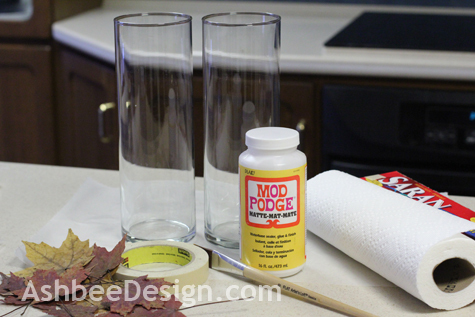 Allow the Mod Podge to dry on the outside. Slide the entire roll, paper towel and all, off the cylinder. Remove the paper towel by collapsing it into the center space. 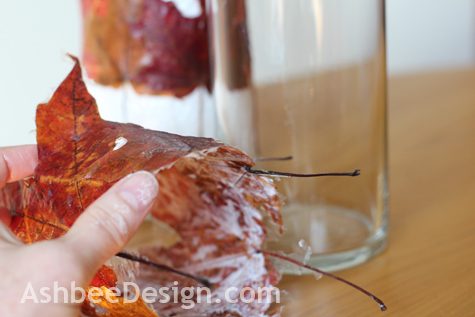 Carefully peel the Saran Wrap from the leaves into the center being especially careful near the points of the leaves. Proceed with care. The Mod Podge is still very wet on the inside. Allow it to dry thoroughly. Once dry, take a pair of small pointed scissors and cut the extra dried Mod Podge away from all the edges. I left the film on the interior openings. Slide the cuff back onto the cylinder. Insert a candles, light and watch! 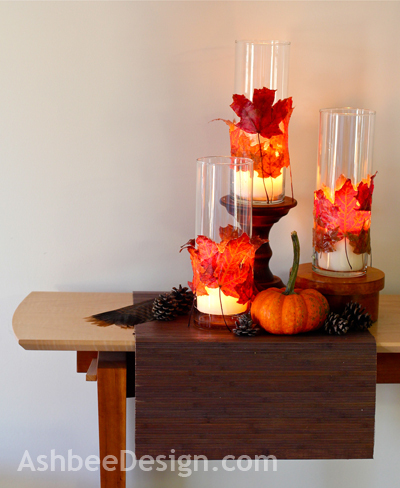 Send pictures of your centerpieces if you try this project.